Buy Sambucol ® Original Black Elderberry liquid 120ml in the UK from our online shop or directly from our independent Scottish store. Glucose Syrup, Black Elderberry Juice, Acidity Regulator: Citric Acid, Preservative: Potassium Sorbate. As official Sambucol stockist, we sell genuine Immune Support directly from our shop in Scotland and online throughout the UK. Sambucol sells drinks made with elderberry extract and/or added vitamins and minerals. View more products from Sambucol. Where can you buy real Sambucol ® Original safely online? 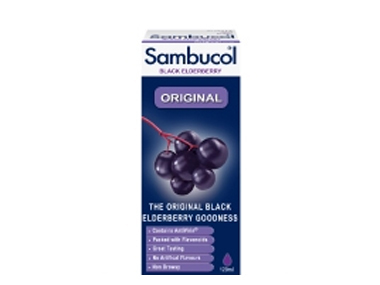 If you are wondering where you can buy Sambucol ® Original Black Elderberry liquid 120ml safely online in the UK, then shop with us. We are an actual health foods shop; with real people selling real foods and products. Our award-winning independent shop is located in Stirling, Scotland since 1976. You can buy our Sambucol Elderberry Extract and other genuine Immune Support in store or safely place an order with us online or over the phone. Sambucol ® Original - Sambucol ® Original Black Elderberry liquid 120ml in Immune Support and Herbal Remedies, Tinctures & Supplements.